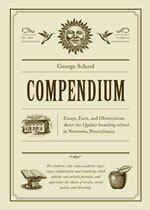 George School’s Compendium is a collection of photos, facts, essays, quotes, and curiosities designed to help you and your family understand the unique nature of George School. It is dedicated to all George School students and graduates. They were the inspiration for the layered and loving collection of facts and observations written by students, graduates, parents, teachers, and community members. Since there are not enough pages in the Compendium to tell the whole story of what makes George School special, we created this Compendium microsite so you can “click away” to find out even more about us. Dimensions. Learn what we cherish about diversity in all its dimensions. For us, inclusivity is a fundamental part of who we are. Mission Statement. Watch a short film that shows students and faculty having fun as they practice reciting the mission statement in unison. Citizen Scholars. Read a mythical tale about a subspecies of adolescents who find themselves compelled to journey to Newtown for schooling. Robotics. Watch the feats of the robots our students created. See them perform the heroics of fire fighters and the moves of a dance group. Creative. Learn how the technical skills and creative thinking practiced in arts classes have been central to the success of our graduates. Among Friends. See a delightful rendition of a student-written song that celebrates the drudgery of working together in the dining room. Teams. Picture which Cougar team you want to play on. Sports try outs start on the first day of school. Great friendships begin then as well. Cougar Crazies. Hear why our fans, affectionately called Cougar Crazies, are appreciated for their high decibel energy at sporting events. Meetinghouse. The exquisitely plain 1812 campus meetinghouse is more than simply bricks and mortar, it is the heart and soul of campus. Campus Life. Imagine how special you’ll feel going to a school that challenges students to be open-eyed, open-minded, and openhearted.